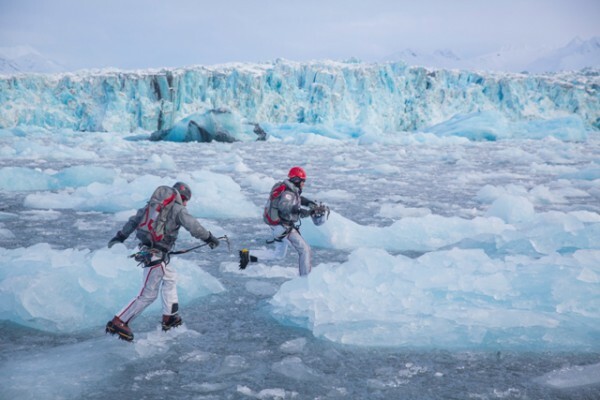 Climbers Matt Szundy and Dave Shuman “berg hoping” in Prince Williams Sound. The call came in the morning. The flight to Alaska was leaving in the afternoon. Producer Steve Fredriksz wanted to know if photographer Ken Pagliaro could make the flight. The longtime Manhattan Beach friends had often talked about working together, but until that day last January, they hadn’t had the opportunity. Fredriksz said they’d be gone about 10 days shooting three, big-budget Coors Light commercials. Pagliaro is known locally for surf photography. But he’s also done extensive travel and action sports photography, including a summer spent hanging off the sides of mountains photographing a team of rock climbers. He packed quickly, but carefully in preparation for whatever challenges shooting in Alaska might pose. Then, while waiting in line at LAX, he received a text from Fredriksz. He would be shooting with Canon 5D cameras. Pagliaro is a Nikon shooter. After the plane took off, he downloaded a Canon manual. At the hotel in Alaska, when he was given a Canon 5D, he retired to his home to rewire his brain. Photographers describe Canon and Nikon controls as being “backwards” from one another. “I was a little stressed ’til I got my hands on the Canon. Then I realized it wouldn’t be a problem,” Pagliaro said. 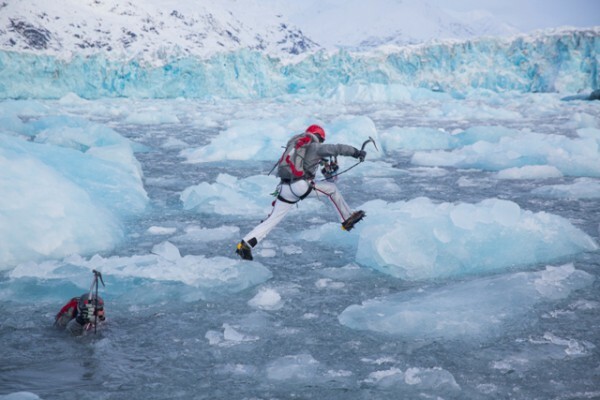 For the first commercial, the crew flew 50 miles by helicopter to the Knik Glacier to shoot a script called “Mountain Tap.” A temporary zip line had been built for actor and climber Ken Alston to race down the mountain carrying an ice bucket of Coors. At the end of the run he passed the ice cold Coors through a portal cut in the glacier to a waiting barmaid tending a warm, busy bar. 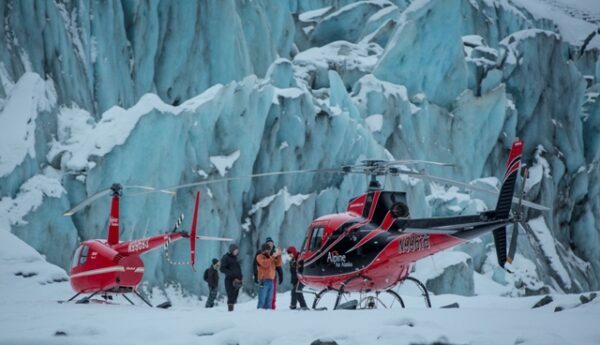 For “Breaking the Ice,” the crew flew to Valdez, where they were ferried by helicopter to the Columbia glacier, whose fingers feed into PrinceWilliamsSound. 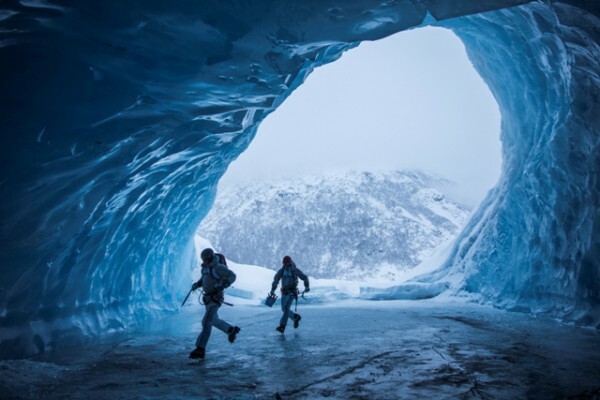 The script called for two icemen to drill a hole in the glacier to recover an ice bucket of Coors Light and deliver it through a trap door in a secret cave to another waiting barmaid tendingn a warm, busy bar. 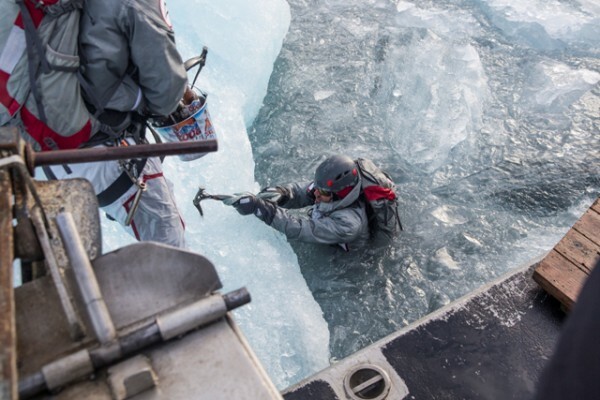 While the camera crews clung to the sides of a small icebreaker, actors Dave Shuman and Matt Szundy “berg-hopped” from ice flow to ice flow, occasionally falling, deliberately, into the freezing water. Between video takes, Pagliaro had the two actors repeat their stunts for still shots that will become print and billboard ads. “They were actors, but acting is the last thing on their resumes. These guys were professional survivalists, the guys you call when the Coast Guard and ski patrol won’t coming looking for you,” Pagliaro said. The final script featured professional snowboarders Jeremy Jones and Holly Enderle racing away from an avalanche. A naturally formed cave served as the location for the portal to the busy bar. They worked from dawn ’til dusk to complete the three videos in just nine days. “At least the days were short. Sunup was 10 a.m. and sunset was 4 p.m.,” Pagliaro said. 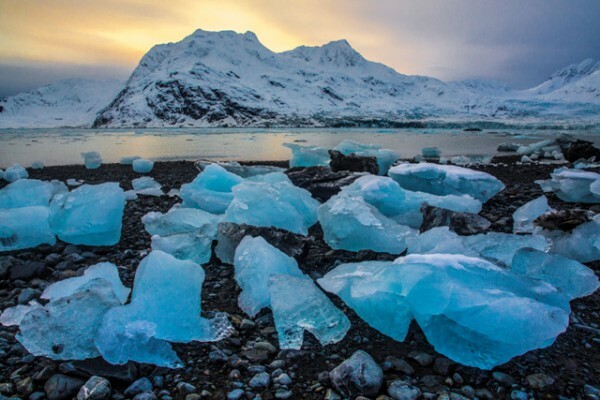 The setting was so magnificent, he explained, that he never gave a thought to the danger, except one evening at dusk when just he and two other crew members were left alone on the glacier with the promise that one of the helicopters would be right back to pick them up. “If, for whatever reason, the copter didn’t return, we’d have had to survive on a six pack of Coors Light,” Pagliaro said.